Sewing machine needles are a part of the sewing machine often underestimated by new sewers. I know this from experience, as I would always use the same needle for every fabric when I was starting out sewing - whether it was leather, cotton or even fine silk fabric. But now, I’m older and wiser and know the special attributes of each different type of needle. There’s just one problem now - what needle do I have in my machine and what is it for? Our high-quality Schmetz sewing machine needles come with a simple colour marker to jog your memory in case you forget which needle is left in your machine from your last project. 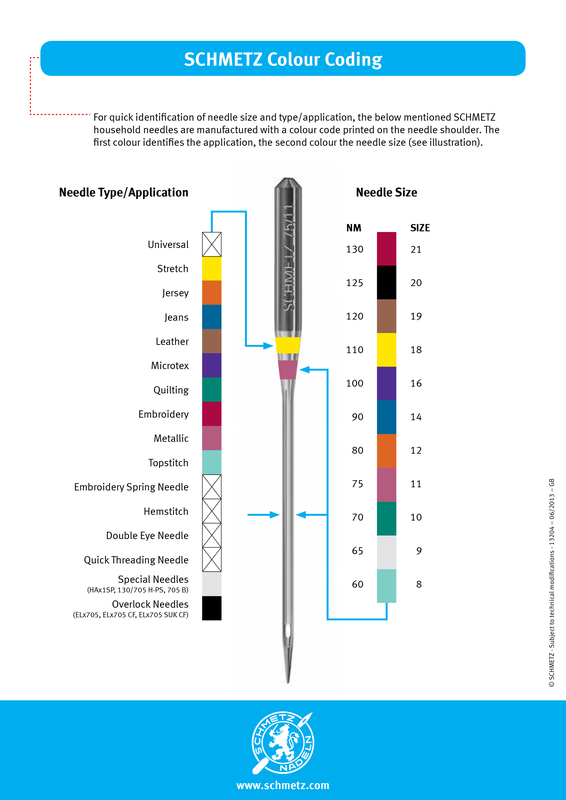 The top line indicates the use/fabric and the coloured line underneath indicates the needle size. This means you can easily see if the needle in your machine is a ballpoint jersey needle or a leather needle with a cutting point. This is very important, as a leather needle would create lasting puncture holes in a jersey fabric, which would damage the material so that the seam could easily rip open when wearing. And if you have a jersey needle in your machine when trying to sew leather, the machine can become blocked, as the needle can’t perforate the material. 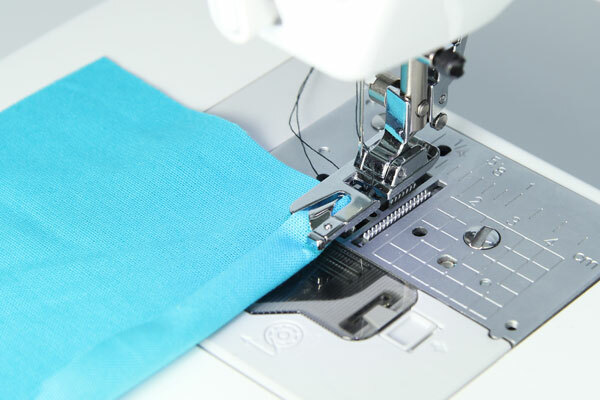 As you see, the right needle is really important for good results when sewing, and for making sure your sewing machine continues to work well. The right presser foot will help simplify the sewing process and will give you a perfect end result. 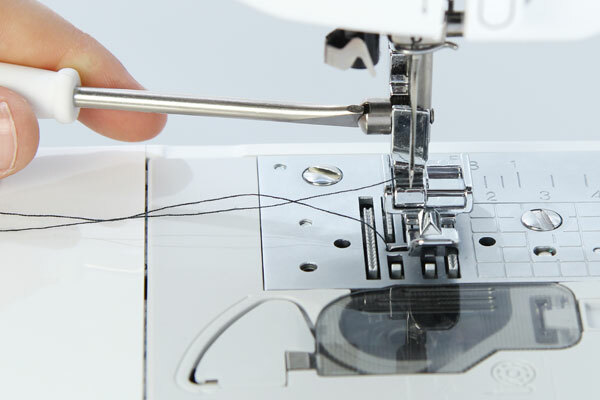 Since questions are repeatedly posed about how to use presser feet and how to attach them to the sewing machine, we shall be explaining this to you in a series of articles. 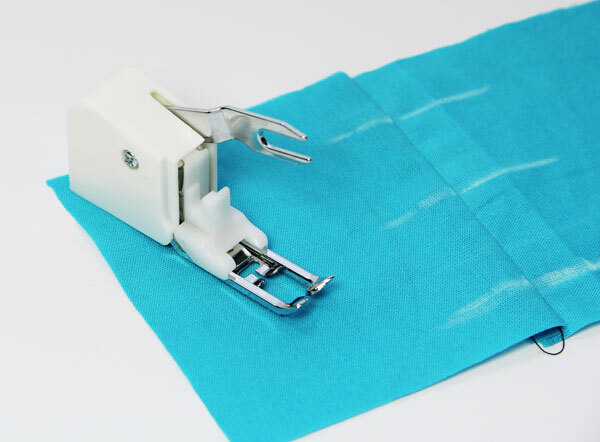 presser feet install: Most modern sewing machines have a foot click system, which means that the presser foot is simply positioned beneath the presser foot receptacle and clicked into place. This makes it quick and easy to change presser feet. In older machines, a specific presser foot receptacle must be attached to the machine. Such a presser foot receptacle is available for both high and low mounting, ensuring compatibility with various sewing machine models. The presser foot receptacle is pressed from below onto the pin of the presser foot attachment and is then secured with the screw. Any foot can now be clicked into place. The important thing is that the screw is tightened completely so that the foot does not come away during the sewing process. Hem foot: What would I use the hem foot for? 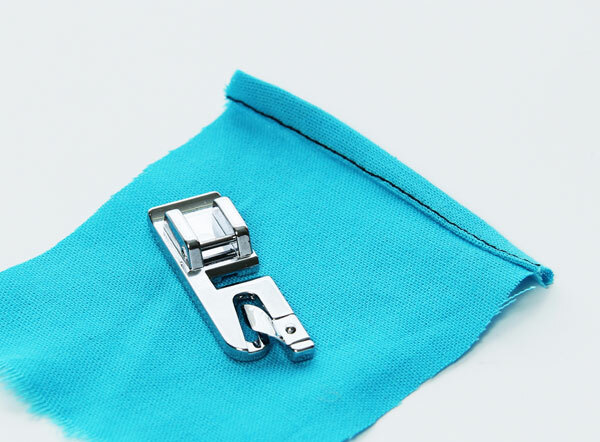 The hem foot is the ideal presser foot for perfect hems – even curved hems – on dresses, blouses, skirts, tops and other clothing. The foot ensures that the fabric is automatically battened uniformly and that an optimal sewing result is achieved. How do I use the hem foot? DThe hem foot is clicked into the presser foot receptacle from below. Thereafter, you must position the fabric to be hemmed in the presser foot. 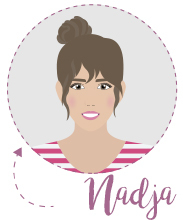 The exact process is shown in the illustrations. It is preferable to start by positioning the fabric around and then under the presser foot by hand, allowing for the desired hem width. Then use a standard straight stitch to sew the hem, ensuring that the fabric is uniformly fed into the presser foot path. Walking foot: What would I use the walking foot for? You should always use the walking foot if you wish to sew fabrics that are difficult to feed through, such as silk or coated outdoor fabrics. 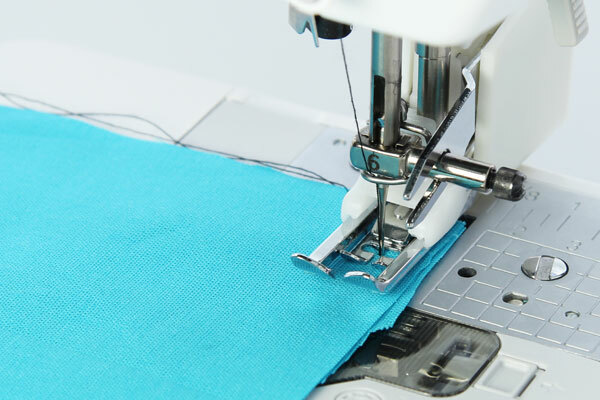 The foot also ensures regular stitch formation when working with corduroy and velvet fabrics and, likewise, helps if you wish to ensure precision when sewing checked or striped fabric. The walking foot is also the perfect choice when working on patchwork projects in which the seams need to be precisely aligned. How do I use the walking foot? The walking foot is inserted into the presser foot receptacle from below and is then clamped securely using the screw. The movable part on the left hand side clamps the screw to the needle and moves up and down with the needle. The sewing process is then exactly the same as it is with any standard presser foot.